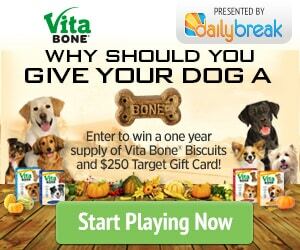 Win a years supply of Vita Bone dog biscuits by entering the Daily Break Thanksgiving contest. You will find out why you should show your thanks by giving your dog a bone this Thanksgiving season. Enter soon. This contest ends on November 30th. After all, it is for Thanksgiving. This contest is only available to residents of the following states: Arizona, Utah, Nevada, Texas, California, Montana, Idaho, New Mexico, Colorado, Washington, Wyoming and Oregon.